To observe the clinical effect of Astragalus Injection (黄芪注射液, AI) and its immuno-regulatory action in treating chronic aplastic anemia (CAA). Sixty patients with CAA were randomly assigned to two groups equally, both were treated with Stanozolol three times a day, 2 mg each time through oral intake, but AI was given additionally to the patients in the treated group once a day via intravenous dripping. All were treated for 15 days as one therapeutic course and the whole medication lasted for more than 4 months totally, with follow-up adopted. 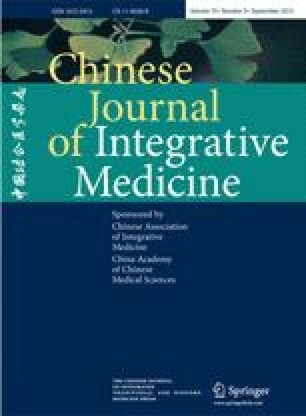 The clinical efficacy was estimated and the changes of T-lymphocyte subsets in peripheral blood as well as the serum levels of tumor necrosis factor-α (TNF-α) and interleukin-2 (IL-2) were observed. The total effective rate in the treated group was 83.3% (25/30), which was higher than that in the control group 66.7% (20/30), showing significant difference between them (P<0.05). Levels of hemoglobin, WBC, reticular cell and platelet were elevated in both groups after treatment, but the improvement was significantly better in the treated group than that in the control group with respect to the former three indexes (P<0.05). The level of CD4+ increased and that of CD8+ decreased significantly after treatment in the treated group (P<0.05), which showed significant difference as compared with those in the control group (P<0.05). Levels of serum TNF-α and IL-2 lowered after treatment in both groups, but significance only showed in the treated group (P<0.05). The degree of proliferation in bone marrow got raised significantly and the percentage of non-hemopoietic cells reduced significantly in the treated group after treatment, also showing significant difference to those in the control group (P<0.05). AI could promote the recovery of hemopoietic function, which might be through improving T-lymphocyte subsets and reducing the release of negative regulatory factors such as TNF-α and IL-2 to alleviate the inhibition on hemopoietic function.